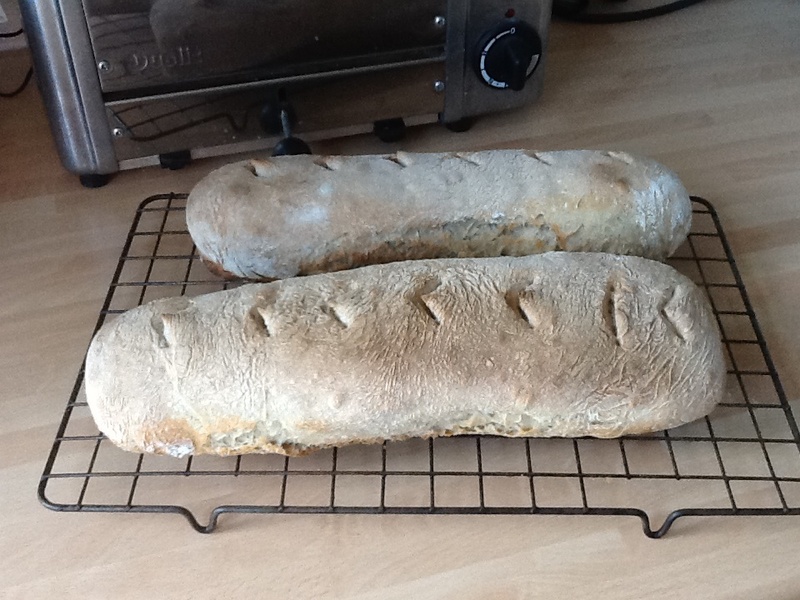 This morning we trialled baguettes at Bread Club. It was a first for us all and we had some fun deciding how to shape them depending on the size of the trays we had each taken! The electric side of my oven is fairly small so I had taken a tray to fit that – but next time I will make them thinner and bake in the larger gas side of the oven. The texture and taste were lovely but the shaping made them rounder and larger obviously! Definitely need to practise the shaping and looking forward to my order from Bakery Bits arriving with a lame to slash the bread more professionally. 1. Mix the yeast and water. 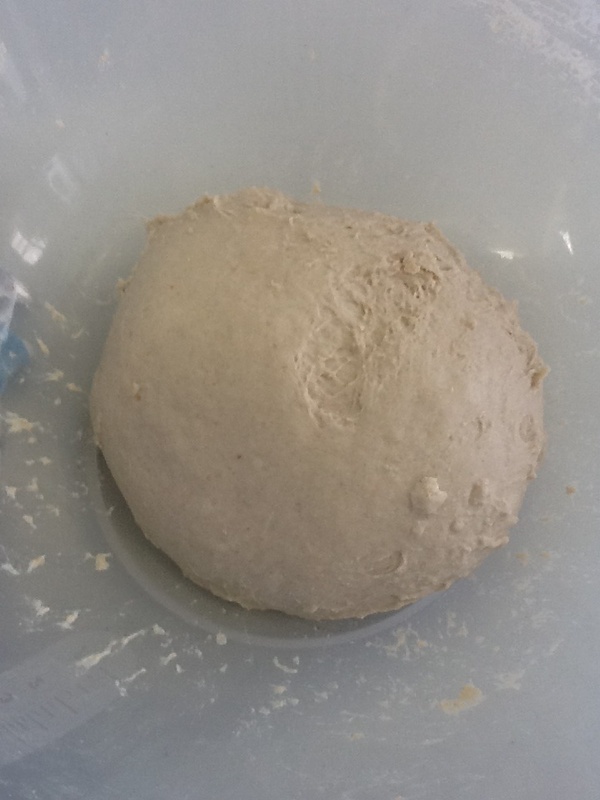 Mix until the yeast has dispersed and then add the flour. 2. Mix making sure that there is no dry flour left in the bottom of the bowl. Leave for 10 minutes. Cover the bowl with a tea towel or plate to prevent the dough drying out. 3. Add the salt and “fold” the dough 30 times, leave to rest for 10 minutes. To begin with it will be very sticky – don’t be tempted to add more flour! For folding pull the dough from the edge out and then back over the centre of the dough, turning the bowl as you fold. 4. Repeat the folding and resting until the dough has been folded 4 times. Rest for 30-40 minutes. 5. 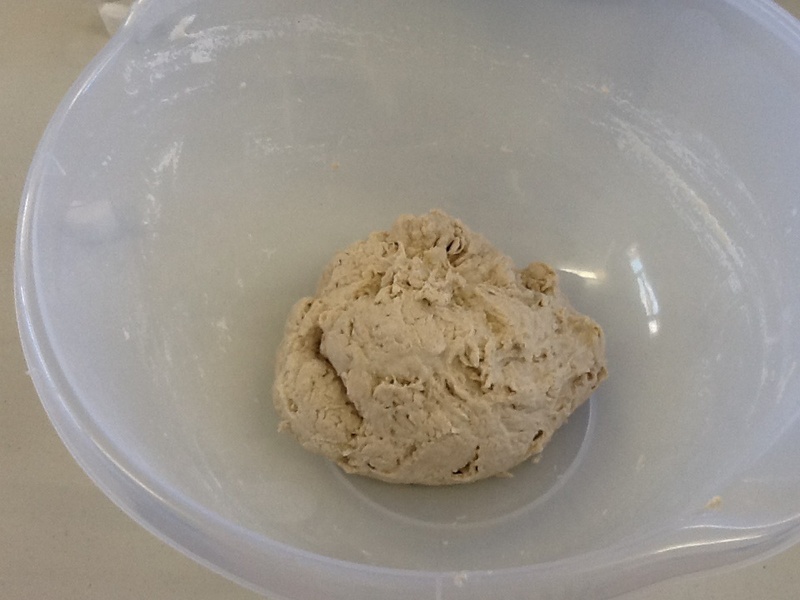 Place the dough on a lightly oiled surface and stretch into a rectangle then fold top third down, bottom third up over the dough then turn 90 degrees and repeat. 6. Return the dough to the bowl and rest for 30-40 minutes. 7. 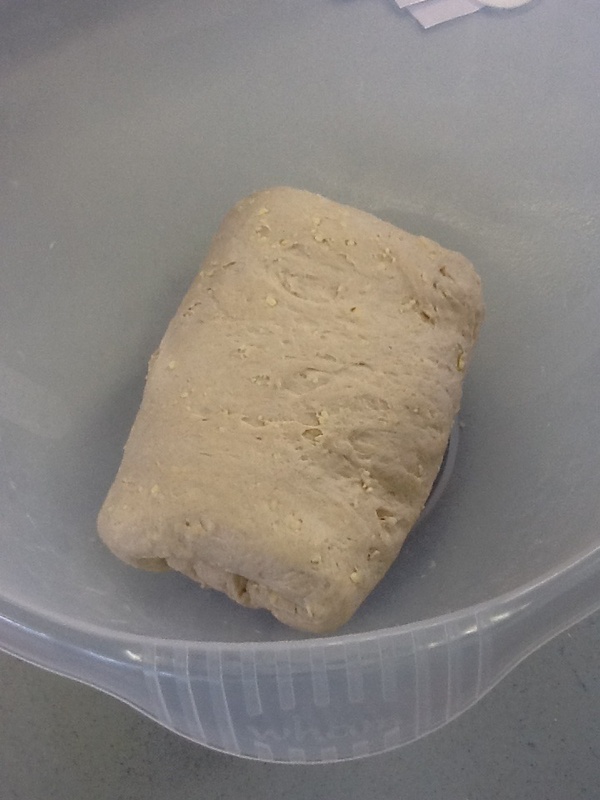 To shape the dough turn it out onto floured surface. Divide into 2 pieces and roll each piece into a ball. Rest for 5 minutes. 8. Line a baking tray with a lightly floured tea towel. 9. Shape into a baguette shape by flattening the ball (rounded side down) into an oval shape. Fold each side of the oval into the centre and seal the edges by pressing down with the heel of your hand. 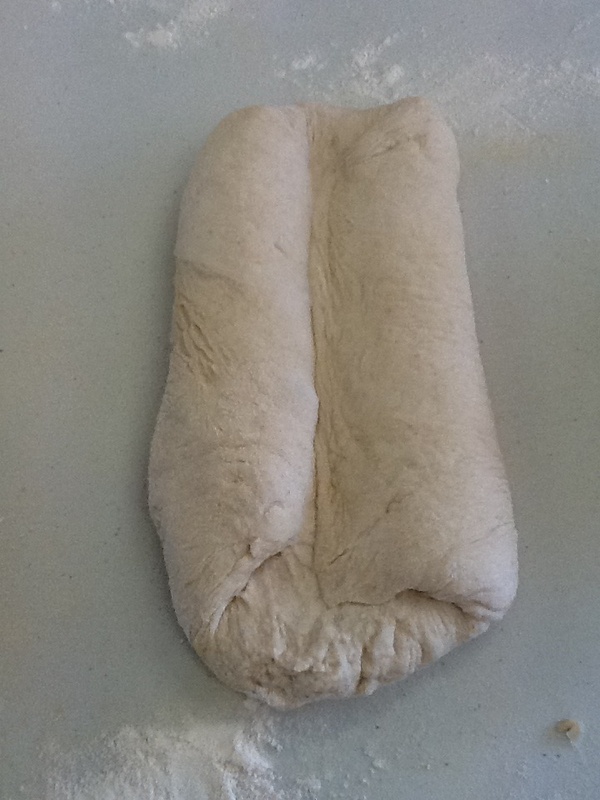 Fold the dough in half lengthways and seal the edge so you end up with a log shape. Extend the length slightly by rolling gently. 10. Place the baguettes on the floured tea towel, leaving a fold of fabric between them to stop them touching. 11. Cover with a tea towel and leave to prove for up to an hour (depending on the temperature) until they have doubled in volume. 12. 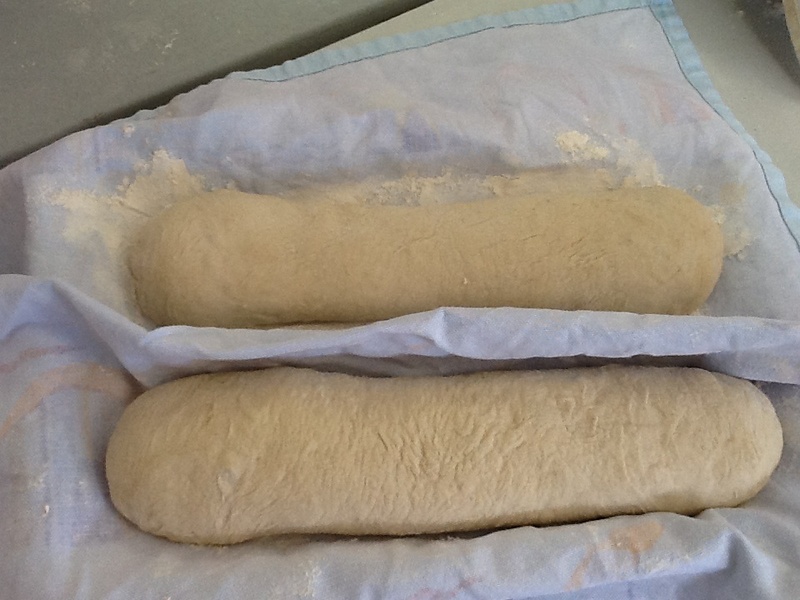 Roll the baguettes onto a baking tray lined with baking parchment so that the good side is facing up. Make 5 or 6 diagonal slashes in the dough using a sharp knife. 13. Bake in a preheated oven at 250 ̊C (gas 9) for approximately 10-12 minutes. For a crunchier crust mist the oven or place a tray of water in the oven during baking. As mine were a little thicker I baked them for about 17 minutes. 14. Place onto a wire rack to cool.